hroughout this website, there may be terms and abbreviations used that require clarification. This section deals with describing many of these articles and is separated into three categories: Technical Terms, Munidean Terms & Historical Terms. Alternate Attack (AA): Initially mapped to MOUSE 2, AA defines a weapon's secondary combat function, be it: Parry, Throw, Aim-Zoom, etc. Coverage: This category describes how large a shield is and how much area of the body it protects passively. The larger the coverage, the more the shield will obscure the player's field of vision and be more likely to inflict larger MVT Rate penalties. Damage (DMG): Damage represents the amount of Health points a weapon, fall or other form of attack reduces from a target. Defense (DEF): Defense describes the protective capacity a suit of armour or shield possesses. 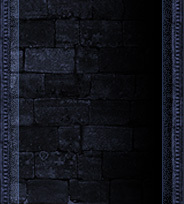 This score is used to absorb DMG before Health points are reduced. Once the DEF score is reduced to "0" Health points are then reduced. Delay: This attribute defines the attacking speed of a weapon or spell and is governed by a small measurement of time between when the player presses the attack button(s) to when the attack itself will be executed. Effect: Effect defines a spell's results when cast. 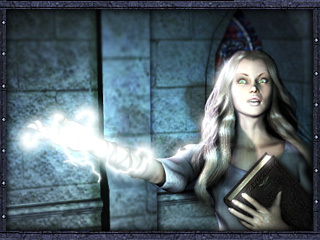 Some spells possess multiple effects depending on what button the player presses to cast it. Movement Rate (MVT Rate): This attribute defines the degree in movement penalties a character will endure while wearing the protective component(s). When the armour or shield is completely drained of DEF points or the object is abandoned, the character's MVT Rate will return to normal. Some vehicles offer bonuses to MVT Rate and allow characters to move much faster while embarked. Primary Attack (PA): This action is initially mapped as the MOUSE 1 button and refers to the main actions of weapons and spells. Restrictions: Not all characters may wear or wield every article of protection. Some characters may be too large, small or of the incorrect gender to utilize these components. Vis Cost: Vis is the fuel for magical spells and a varied level of this "ammunition" will be expended depending upon the spell being cast. Spells that require a higher Vis expenditure than the player's available Vis reserves will fail to be cast. Atrid, The All-Father: In the predominant Parmathian religion; Atrid, or the All-Father, is worshipped as the central deity. Despite the efforts of the Atridian Church to influence the populace into practicing monotheism, there are small separatist sects of the religion that acknowledge other deities beyond what Atridians originally defined as mere saints. Cathán: Atridian scriptures refer to this legendary figure as a saint who was slain while in the service of Atrid during the War of the Gods. Separatist sects found throughout the northern regions of Parmathia greatly dispute this perception and claim it was Cathán, another god within a polytheistic pantheon, who delivered the final blow to the Mother of Lies. Heated debates as to this figure's true station have led to violent confrontations between the two religious sects. Cathánite: A follower of the separatist sect of women priestesses that teach the word of the warrior-god, they believe, slew the evil Malithe at the culmination of the War of the Gods. Dwarf Wars, The: As King Alcazar Varden I's campaigns to expand the kingdom were carried out, the Dwarfs of the north forbade further exploration and warred upon Parmathia for many decades. The war was finally ended when an armistice was signed by both factions after countless casualties were suffered on both sides. The terms of this treaty forbade northern expansion by Parmathian forces. House: Noble families that comprise the ruling dukes and duchesses of Parmathia are known as Houses. Like clans from the olden days, noble Houses strategically marry to gain political strength and land ownership. There are currently 14 Houses within Parmathia: Adler (Eagle), Austerfeld (Ram), Ahearn (Stallion), Elkhardt (Stag), Griswülf (Wolf), Grünwärter (Oak), Kardrak (Dragon), Löwen (Lion), Nacht (Crescent Moon), Onora (Gryphon), Stolzuhr (Sword), Ulstrom (Three Chevrons), Varden (Shield) and Waldentraud (Sun). Kahjin: The empire of the east, the word translates to "The People of Light" in their foreign tongue. The Kahjini (natives of Kahjin) are a desert-dwelling people believed to worship a dragon-god. Their dark complexions and mysterious tattoos have made them easily discernible from the Parmathian populace. Löwen: A decorated hero from the crusade across the sea turned primary antagonist in the War of the Crown, arch-duke Salatas Löwen is only a partial noble of Parmathia. His land was inherited by his father; duke Magnus Löwen who had raped a Kahjini sultana. The woman bore him a son before she was murdered by Parmathian knights during the crusade. Determined to protect his son from scrutiny, Magnus wed another wife quickly; the duchess of Ventil in the southern reaches of the kingdom and she bore him another son - a younger half-brother to Salatas. The union of the duke & duchess joined their lands to form the grand duchy of Löwengrube. Salatas would later inherit these lands and become a great military leader while his younger brother dedicated his life to the Atridian Church. Salatas' loyalty to King Alcazar II was unwavering and his zeal to protect Parmathia from Kahjini invasion was legendary. The word "Löwen" translates to "Lion." Order of the Dragon, The: The Order was an ancient sodality of Kahjini magi who practiced the Dark Arts and pledged their undying loyalty to a dragon; Veraxis. After the onset of the crusade, the Atridian Church decreed their practices heretic and waged an inquisition that wiped through The Order in a flash of burning books and destroyed schools of practitioners. Some of the older Atridian scriptures describe Veraxis to be the very dragon Malithe rode into battle when she confronted Atrid in the War of the Gods. Onora: The duchy that rests in the northern reaches of Parmthia. 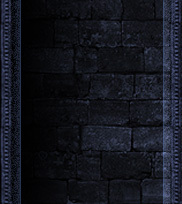 It was awarded to Lord Emerest Onora by King Alcazar Varden I for valor during the Dwarf Wars. Emerest was succeeded by his son; Elikor II, who now rules the duchy in many ways similar to his father. Malithe, The Mother of Lies: This maligned figure in Atridian doctrines is described as "The Mother of Lies" and was vanquished upon the slopes of "The Pillar of the Heavens" ages ago. It is believed that Malithe had tried to seduce followers into abandoning the righteousness of the Atridian dogma and follow her on a crusade to trounce The Lord of Light from his divine throne within the heavens. Some texts describe her as a beautiful, grey-skinned woman with massive, raven-wings sprouting from her shoulders while other accounts have claimed she was a withered hag peering out at her victims through white eyes that burned with malevolence. Munidea: The world in which our tale takes place, Munidea bares many similarities to Earth's Europe during the Dark Ages. The word "Munidea" is a play on the word "Mundane" which is a derivation of the Latin "Mundus" meaning "World." Parmathia: This kingdom spans great distances from the frigid northern reaches of the nordlands, to the verdant forests and pariares of the midlands and to the shores of the Sidon Sea in the southern reaches of the Ostlands. The world beyond these borders is an unknown frontier filled with dangers on every horizon. The word "Parmathia" translates to "Shield of the Gods" in the ancient tongue. Pillar of the Heavens, The: The tallest mountain in the known world, this landmark is where the final showdown between Atrid and Malithe took place during the War of the Gods. Located in the icy wastes of the far north, beyond Parmathian civilization, this ominous mountain can be seen for many miles. It has been given many names by the peoples living in its shadow including: The "Soul Spire" and "Mt. Shaddai." Red Plague, The: This virulent disease wiped out a large portion of Parmathia's population. Its symptoms include a ruddy rash that eventually spreads over the entire body and causes immense pain before finally killing the victim. The Sisterhood of Cathán have speculated that the plague was started from tainted water and helped bring about a cure. The Atridian Church believed that the plague was a curse from the Mother of Lies herself and blamed its initial outbreak on heretics. Varden: The royal family now ruling Parmathia, the Vardens have presided over Parmathia for many generations after the War of the Gods. The current sovereign is King Alcazar Varden III. His reign began after his father; King Alcazar Varden II, died from the Red Plague when Alcazar III was only 12. Veraxis: The multi-headed dragon Malithe rode into battle during the War of the Gods, Veraxis was believed to have been slain alongside his mistress according to Atridian scripture. The Kahjini believe "Veraxis", meaning "Truth" in their language, actually survived the war and fled east to Kahjin after the defeat of his ally, Malithe. War of the Gods, The: Described as a period of great conflict between the gods of the world who all sought dominion over one another. It is written that the battle lasted for centuries and shaped the lands into what they are now. Very little specifics are known other than the war ended when Malithe was slain atop Mt. Shaddai (also known as: The Pillar of the Heavens). Barony: A small portion of land within a duchy that is ruled by a baron or baroness. There are usually many baronies within a strong duchy. Chivalric: This is the lowest rank of nobility and generally consists of barons or knights who have proven themselves worthy and have been granted small parcels of land. 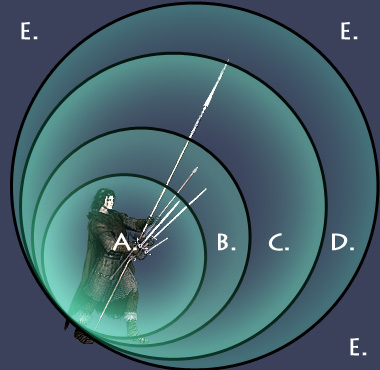 Cross-Guard (Quillions): The perpendicular portion of the sword that meets the blade. Cuirass: A breastplate that usually protects the wearer's back as well. Cuisse: An article of armour that protects the thighs. Duchy:: Duchies comprise a kingdom the way states/provinces comprise a country. Some duchies are larger than others and all are ruled by a Duke or Duchess who answers only to the King or Queen. Dukes/Duchesses, in turn have barons/baronesses who answer to them. A King/Queen's rule supercedes all edicts and treason against one's King/Queen is considered the most heinous of crimes. Fauld: An article of armour that protects the waist and mid-section. Fletch: A guidance system placed upon the rear of an arrow and is generally constructed of feathers. Fyrd, the: During times of war, nobles may call upon all able-bodied men between the ages of 12 and 50 to take up arms and serve within an army. Since it is explicitly forbidden for the ignoble to bare arms without express permission from a noble, many peasents who serve in the fyrd lack the discipline and experience their noble counterparts possess and are usually overcome easily in battle as a result of this. Gorget: An article of armour that protects the throat. Greave: An article of armour that protects the lower leg. Grimoire: A book containing special notations and/or magical spells. Haft: A handle for a weapon. Hauberk: A long coat constructed of mail that extends to the knees. Hilt: Area of a sword that contains the cross-guard (quillions), grip & pommel. Kingdom: An area of land ruled by a king or queen, kingdoms are centralized by a capital where the monarch passes edicts and collects tributes from his/her dukes/duchesses. The Kingdom of Parmathia is currently ruled by the boy-king; Alazar Varden III. Mail: A term used to describe a series of interconnected rings to form a chained mesh for protective uses. Often times it is mistakenly referred to as "Chain-Mail." Parry: To deflect an incoming blow with one's weapon or shield. Pauldron: An article of armour that protects the shoulders. Poleyn: An article of armour that protects the knees. Pommel: Located at the base of the grip, this device is designed as a counterweight to help balance a sword. Quarrel: The ammunition for a crossbow. These smaller, thicker arrows are usually fletched with leather or wood instead of feathers. They are also referred to as "bolts." Ricasso: Area of the blade left blunt and existing just beyond the quillions. This section is used as an additional grip during tight maneuver situations and may possess a second, smaller quillions just before it is converted to a sharpened edge. Sabaton: An article of armour that is worn over boots to protect the top of the foot. Some sabatons possess spurs for horsemanship. Squire: Squires are knights-in-training who attend to the needs of their lord. Most squires enter their duties at a young age and will eventually reach knighthood if/when they have proven themselves worthy to their benefactors. Surcoat: Also referred to as a tabard, this cloth vestment is worn over a suit of armour to display one's allegiance with heraldic imagery. Tasset: Plates fastened to the cuirass to drape below it and protect the thighs and mid-section. Vambrace: An article of armour that protects the arm.